Emergence of ‘super hospitals’ highlights urban-rural health divide. In the emergency center at China’s largest hospital, a girl in a black quilted jacket changes her high heels for slippers. Covering a row of steel hospital seats with a blanket, she makes an impromptu bed. She stuffs her possessions underneath: a thick quilt, a thermos flask, and a box of tissues. 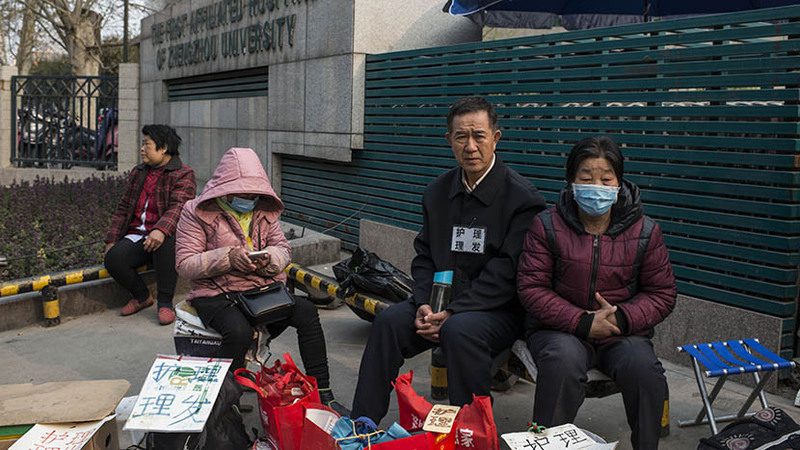 Twenty-six-year-old Zhao Yu has been camping out for more than a week at the First Affiliated Hospital of Zhengzhou University (Zhengzhou First), in the capital of the central Chinese province of Henan. A time-lapse video taken at the First Affiliate Hospital of Zhengzhou University, China’s largest hospital, in Zhengzhou, Henan province. In rural China, most people associate bigger with better when it comes to health care, and for good reason. Outside of provincial capitals, access to medical care people can trust is limited. That’s not necessarily because of a dearth of hospitals or even of modern equipment, but instead boils down to an absence of well-qualified doctors and poor services at the local level. Large hospitals act as magnets for large numbers of people who are unwilling to put their lives in the hands of medical staff at smaller hospitals and clinics. Yet it is precisely these types of smaller, community-based hospitals and clinics that the central government sees as a major pillar of its health care strategy, which aims to bring affordable health care to all of its citizens by the end of this decade. As such, super hospitals like Zhengzhou First represent a dilemma for policymakers: They meet a clear demand today, but in the long run their presence may be a hindrance to achieving a more sustainable health care system in China. Last year, Zhengzhou First admitted around 350,000 inpatients and just under 4.8 million total patients, according to the hospital’s president, Dr. Kan Quancheng. On Feb. 15 the hospital received close to 20,000 outpatient visitors in a single day, making it one of the busiest days in the hospital’s history. Officially, the hospital has 7,000 beds, Kan told Sixth Tone. By this standard, it’s the largest hospital on a single site in China. Around the country, there are at least 10 “super hospitals” — that is, hospitals with more than 4,000 beds — have popped up in recent years. 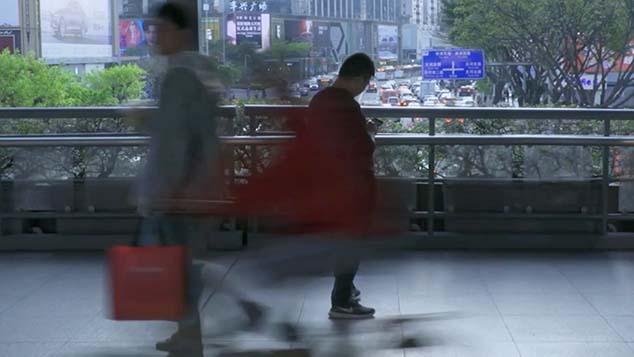 Zhengzhou First sprawls over several buildings, some up to 28 floors, and treats a broad range of health-related conditions, ranging from heart disease, urinary health, lung ailments, and cancer treatment. It even has its own fire department and police station. The rush to seek attention in super hospitals like Zhengzhou First has its roots in the historical development of health care in China. It is also linked to a host of other factors, such as rising income and improved transportation. But all of this only provides a partial explanation for the growth of super hospitals. At their hearts, super hospitals serve to underline the continued development of China along dual tracks — where large divisions between urban and rural have become increasingly pronounced. In the decades after the establishment of the People’s Republic of China in 1949, many urban dwellers were attached to a danwei, a work unit overseen by the Communist Party, which would cover their medical costs. Strict referral systems also made it difficult for patients to seek out attention at larger hospitals. Those living in the countryside were also reasonably covered under agricultural communes that gave basic health coverage. Much of rural health care was provided by “barefoot doctors” — people with minimal training in medicine who were nonetheless capable of administering simple public health measures. But over time, the major political and economic transformations that swept through the country, including the opening up of the economy and the shift away from central planning, saw a gradual reduction in the role of the state in people’s day-to-day lives, including their health care. “In the 1980s, when the previous rural cooperative health care system gradually decreased, a lot of rural dwellers could no longer afford their medical fees,” said Cai Jiangnan, director of the Center for Healthcare Management and Policy at China Europe International Business School in Shanghai. In the past decade, China has made significant advances in providing health insurance. For those in the countryside, measures in the form of the New Rural Cooperative Medical Scheme, introduced in 2003, meant that health care was once again affordable. According to Cai, this led to a drastic increase in the number of patients seeking out medical attention at big hospitals. Statistics from the World Bank show that China spent just over 5.5 percent of its GDP on health care in 2014. By comparison, the United Kingdom spent over 9 percent on health care in the same year. China has pledged to achieve affordable and high-quality health care for all of its citizens by 2020. Martin Taylor, the coordinator of health systems and health security at the World Health Organization’s China office, described the health care plan as “one of the most ambitious” in the world. “If China achieves it, that will provide lessons for the rest of the world,” Taylor told Sixth Tone in a telephone interview. On a recent morning in March, Zhengzhou First appeared to be bursting at its seams. Wards accommodated beds far beyond the number for which they were designed. Corridors were also lined with beds — not gurneys — adding to the official bed count, and patients, some attached to IV drips, sat listlessly waiting for treatment. 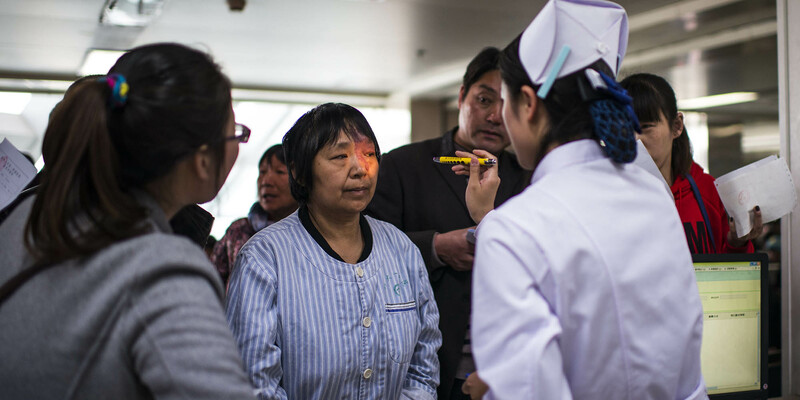 As in the case of the Zhaos, illness in China is a family affair, and the hallways are further congested with relatives who are on hand to take care of their loved ones, absorbing some of the duties of overstretched nurses. For Zhao, this means pushing her brother from ward to ward herself. The hospital has more than 5,000 nurses, for whom shifts of more than 13 hours a day are not uncommon, according to head nurse Liu Yanjin. In this sea of people, privacy is swept away. A nurse shines a light into the eyes of a female patient, surrounded by crowds of people anxious to have their query answered or to be assigned an appointment with a doctor. Frustration hangs in the air, and there are tired and weary faces all around. Elsewhere in the hospital, consultations on personal issues such as infertility take place within earshot of bystanders. With crowds everywhere, the task of getting to a medical appointment or visiting a sick relative can be a logistical nightmare. On one floor scores of people push to squeeze into an elevator designed to accommodate a dozen at most, while others simultaneously shove to get out. People are shouting, and someone thrusts a red plastic basket containing flowers and fruits high above the bobbing heads to keep its contents safe. In the tussle, one young woman accidentally drops her national identity card on the floor. She scoops it up swiftly before re-entering the battle to board the lift. 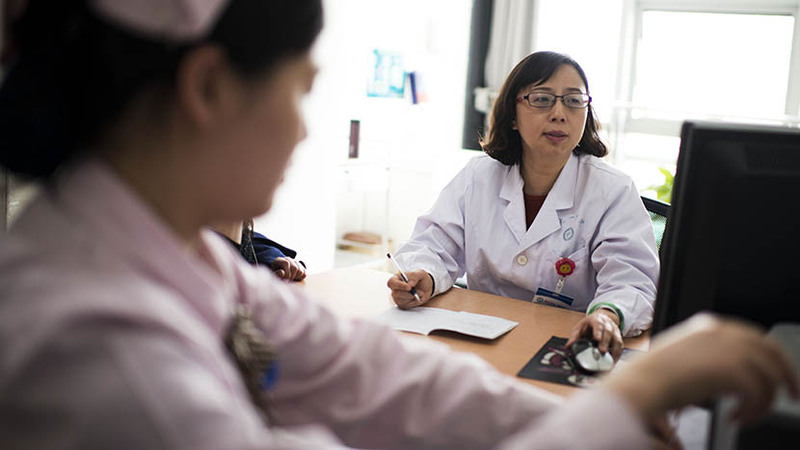 Despite the crowds, the lack of facilities, and the relatively high cost of treatment, Zhengzhou First still compares favorably to the horror stories that have emerged from hospitals in other parts of the country. The buildings and public areas at Zhengzhou First are modern, and the hygiene standard appears to be adequate. In China, getting information from harried hospital staff can be an ordeal in itself, but in this regard, Zhengzhou First does an admirable job. The names, titles, and specialties of each ward’s doctors, along with regularly updated patient waiting lists, are displayed on large screens around the hospital. In other hospitals around China, frustrations surrounding treatment can quickly escalate into violence. In December, more than 100 medical workers took to the streets to call for greater protection in Yongqing Town in the northern Chinese province of Hebei. Their actions followed three doctors being taken as hostages the night before by relatives of a patient who had died while under care. 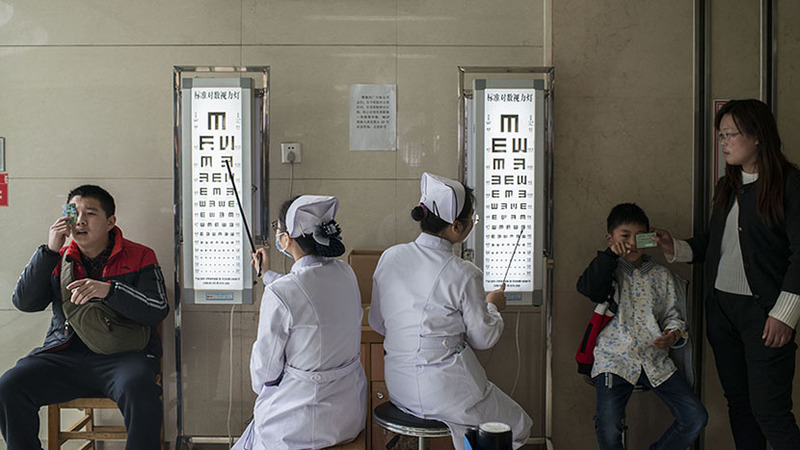 Kan, the president of Zhengzhou First, said the hospital experiences around 30 cases of altercations between patients and staff a year — a tiny fraction compared to the millions of people who come through its doors, he added. 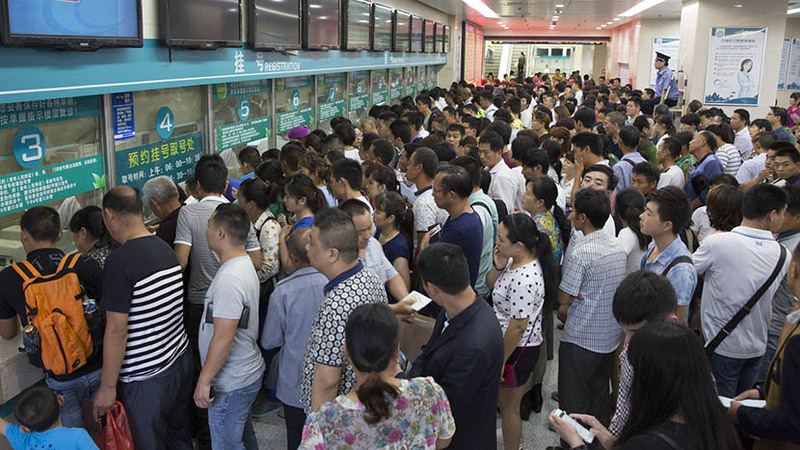 Earlier this year a video showing an enraged woman at a hospital in Beijing shouting at appointment-slip scalpers sparked national debate when it went viral on social media. The woman had traveled from a distant part of the country but was unable to see a doctor even after waiting in line for an entire day. Scalpers had got their hands on appointment slips to see doctors and were selling them for 4,500 yuan each — 15 times the official price. In the days that followed, authorities swept in and arrested dozens of scalpers, many of whom were found to be in cahoots with hospital staff. This abuse, widespread throughout the country, highlights how some doctors and nurses turn to illicit activities to supplement their meager base salaries. A report from the Chinese Medical Doctor Association issued in 2015 showed that, in the previous year, around 30 percent of doctors earned less than 3,000 yuan per month. Around 37 percent earned between 3,000 yuan and 5,000 yuan. At Zhengzhou First, hospital officials say there isn’t a serious scalping problem. Instead, young girls dressed in pink flight attendant-like uniforms are on hand to assist patients with registration, a process which is entirely automated. Provided one has previously registered at the hospital, knows exactly which doctor one wants to see, and has the right mix of banknotes and change ready, the process will only take three minutes. It’s a convenient and pleasant start that belies the hours, sometimes days, of chaos and waiting that lie ahead. Super hospitals such as Zhengzhou First have emerged as a response to the growing and often overwhelming demand for medical care in China’s heartland. 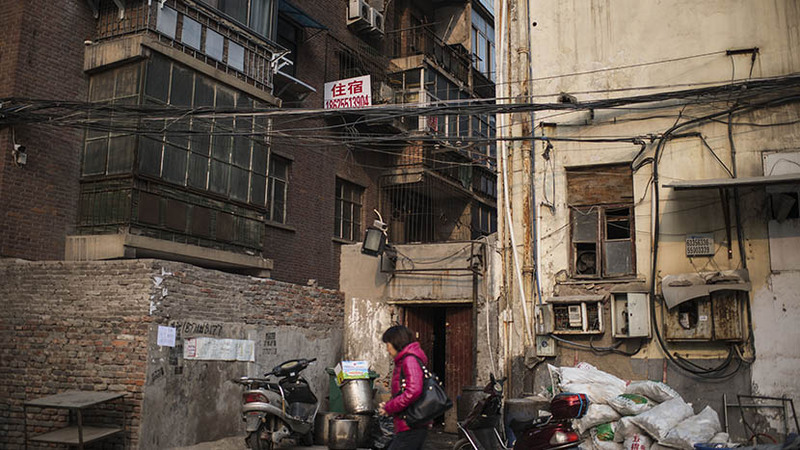 Henan is among the country’s poorest and most populous provinces. Around 106 million people lived there as of 2014. By contrast, the population of Japan is around 126 million. Despite decades of mostly breakneck growth, the province has not kept pace with the rest of the country. In terms of GDP per capita, Henan ranks 27th out of the 31 provinces, autonomous regions, and municipalities of mainland China. As is true on a national basis, the central and provincial governments have made significant investments in infrastructure, especially relating to transportation. In the past decade, more than 4,000 kilometers have been added to Henan’s roads. High-speed rail lines now crisscross the province, and Zhengzhou is home to China’s largest railway station. 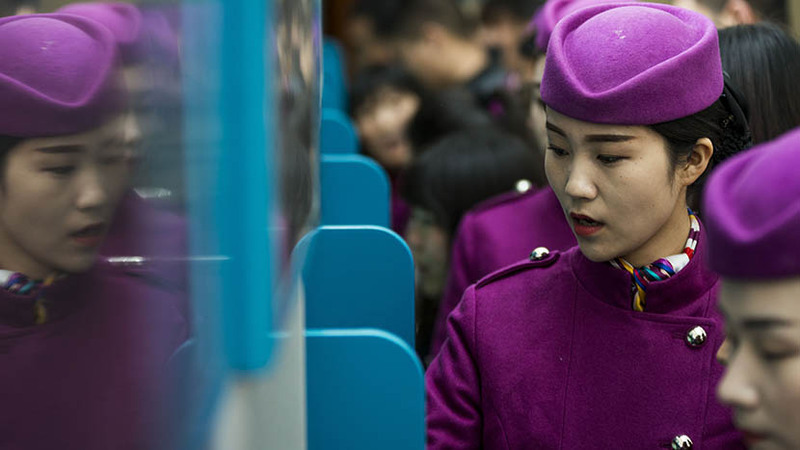 Rising income and improved transportation mean it is now easier than ever for people from all over Henan to travel to the provincial capital of Zhengzhou in search of medical attention. In addition, as China’s population ages and non-communicable diseases such as diabetes and cardiovascular ailments become more prevalent, the need for medical care is growing. An important catalyst leading to booming demand for health care has been reforms to health insurance plans. In particular, the New Rural Cooperative Medical Scheme allows a greater number of people from the countryside to receive medical attention in cities and still be eligible for reimbursement under the Chinese health care system. A report posted by the Henan government to its website in January shows that for people covered by the new plan and earlier similar plans, only 31 percent opted to seek medical care at local hospitals in 2015, compared with 60 percent in 2003. According to Kan, 72 percent of the hospital’s patients are covered under the rural health care system. “It pushed our expansion,” he said. One individual eager to make use of improved transportation connections is Jason Kang. His first experience with Henan’s medical system came when his mother tried to commit suicide by jumping from a roof in a small town three and a half hours by car from Zhengzhou. The urgency of the situation meant that Kang only had time to take his mother to a small local hospital. There, doctors told Kang that his mother’s chances of survival were less than 20 percent. Seeking better care, Kang moved his mother to another medical facility in the nearby city of Dengzhou. “Even though the hospital was just built two or three years ago and all the equipment was new, the service was terrible,” Kang told Sixth Tone in a telephone interview. His mother lay soaked in her own urine in her bed while nurses casually browsed the Internet on their computers, only appearing when they could nickel and dime him and his family for everything from “special” cushions to hot water. Wherever imbalances exist, it usually doesn’t take long for someone to leap in and seize an opportunity. 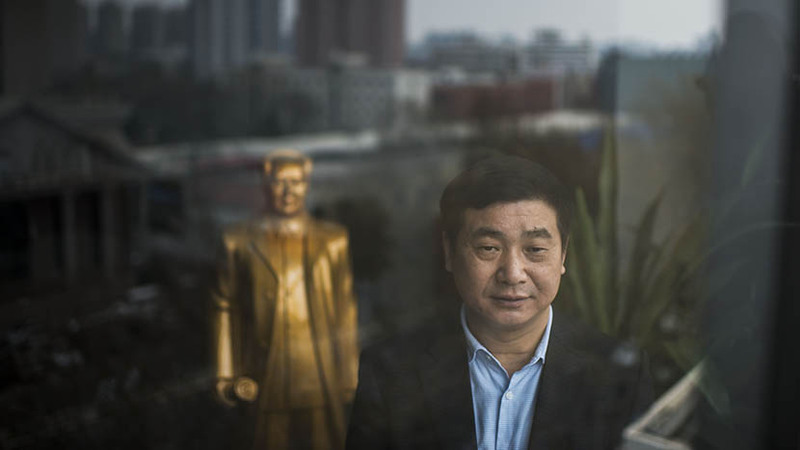 Enter Kan and his plans for Zhengzhou First. Before he took the helm of the hospital in 2008, it was still relatively small, with only 1,860 beds. That was soon changed. Where there once were trees and a beautiful garden, there is now a large parking lot. “The major drive behind our expansion is the huge demand,” said Kan, who hails from a rural corner of Henan. Under his guidance the hospital has rapidly expanded and, given the huge numbers of people visiting every day, become an important hub of economic activity extending beyond the hospital’s walls. Providing healthcare to such a large number of people is also proving lucrative. In 2015, the hospital generated 8.4 billion yuan in revenue, up 11.8 percent from the previous year. Revenue in 2008 was 680 million yuan. Still, Kan said that his hospital’s biggest challenge is the shortage of government funding. The main source of income at Zhengzhou First comes from the fees it charges for surgeries and checkups, Kan said, while income from the sale of medication is the second most important revenue generator. At Zhengzhou First, the price of checkups depends on the nature of the test — an ultrasound can cost at least 80 yuan, while a CAT scan for a specific part of the body costs around 280 yuan. The average bill for patients at China’s larger public hospitals was around 277 yuan per visit in the first nine months of last year. For inpatients, that figure was around 12,500 yuan. 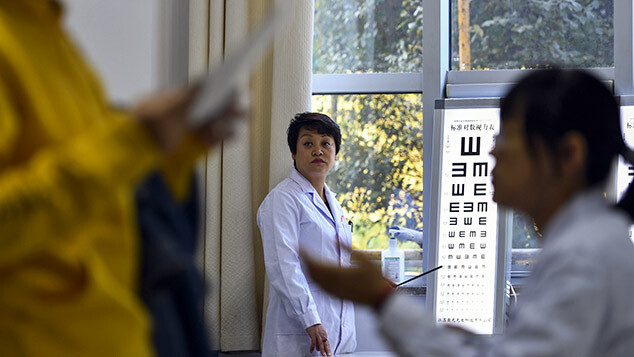 In general, medical expenses have been rising in China, with outpatient and inpatient costs increasing by 4.2 percent and 3.8 percent respectively, according to official statistics, compared to the same period a year earlier. The hospital has also spawned a host of opportunities for small businesses and private individuals. These people and companies often step in to fill voids that are not sufficiently filled by Zhengzhou First. 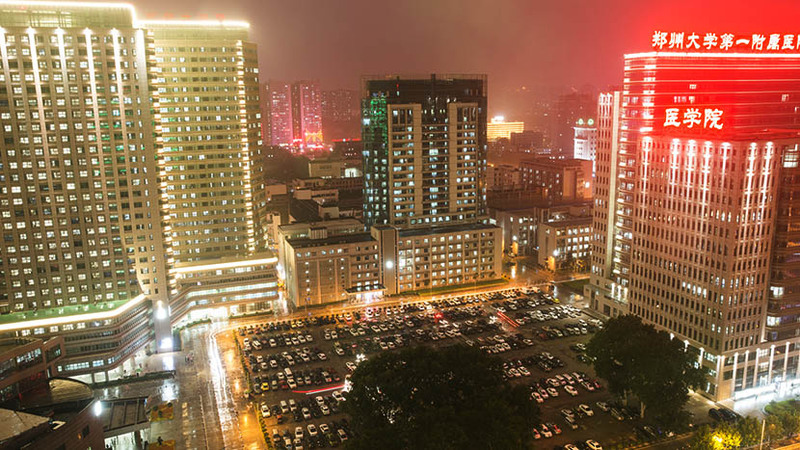 Others see an opportunity in providing backup infrastructure such as food and accommodation — important provisions for the overall quality of health care for patients and their families, and yet ones that seem to have been sorely ignored when Zhengzhou First was explosively expanding. At the gate of the inpatient department, several middle-aged men and women sit on stools and carry signs that read “health carer,” with phone numbers listed below. These people are on hand to offer their services, particularly to the patients and families who have traveled from outside Zhengzhou and who may not have the support network of local family and friends often needed to navigate and endure a period of hospitalization in China. Fifty-eight-year-old Zhao Xigeng said he and the other health carers are not official employees of the hospital. Instead, he charges around 160 yuan per day to look after patients who cannot take care of themselves. “Sometimes the patients’ families come and ask for help, other times the hospital cleaners recommend us to the patients,” he said. Because many people have to travel for treatment, outpatients and their families are often forced to stay in nearby hotel accommodation. Most of the hotels in the vicinity are either fully booked or charge high rates compared to hotels in other parts of town. To limit expenses, many patients turn to accommodation rented out by landlords in the surrounding neighborhood. Even though some of these rooms are in bad condition, they can still fetch 50 yuan per night — or 70 yuan for ground floor rooms, which are especially coveted by convalescing patients or by those who have difficulty climbing stairs. 2020: Are We There Yet? 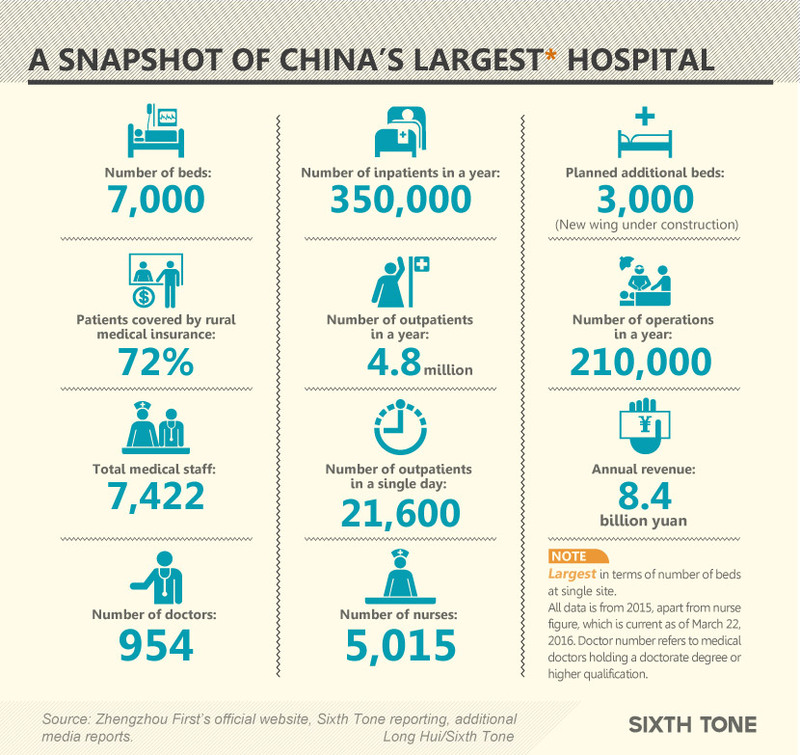 Four years is not a long time to overhaul a health care system of China’s size — the country had 13,314 public hospitals and institutions as of 2015. But some progress has already been made. Access to health insurance has expanded, and China now provides basic health care, including prenatal care. There are some signs of change, mainly in the form of a growing number of hospital administrators demonstrating a greater willingness to try out new approaches. “An important part of public hospital reform is to increase the accountability of hospital managers to deliver affordable and appropriate hospital care to the public, and they should be given increased managerial autonomy to do this,” said Taylor. He pointed to a number of pilot projects around the country that have shown how modifications to different aspects of the health care system have begun to yield positive outcomes. In the eastern Chinese province of Fujian, for example, the government in Sanming has initiated reforms aimed at better controlling the price of medication — and they are showing promising results. The challenge is to move such reform efforts from just being isolated pilot programs to ones that are more comprehensive and rolled out on a national level, said Taylor. For now, the key tasks are to build up the broader network of hospitals and to attract the right caliber of staff. Kan sees his super hospital as playing an important part in enhancing his province’s medical system. He said that in the past, Henan, with its poor medical infrastructure, had difficulty attracting good doctors or other medical resources from the dominant cities like Beijing and Shanghai. “But now more and more resources are coming Henan’s way because we have developed a big platform here,” he said, referring to Zhengzhou First. 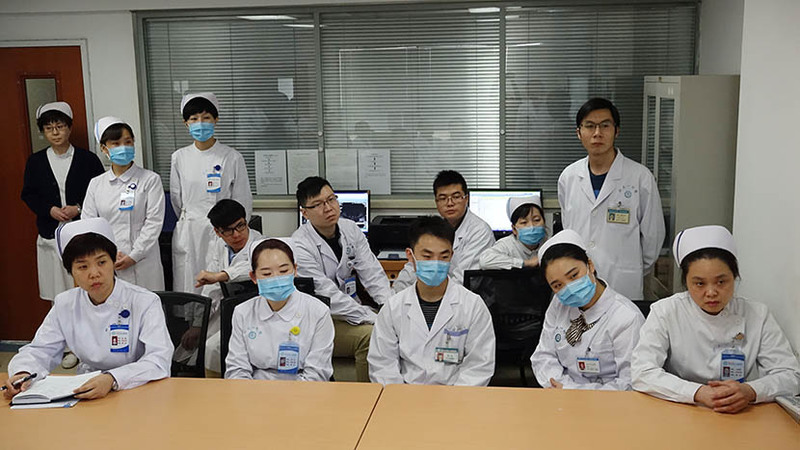 Even if young doctors decide to work in China’s inland provinces, they are more inclined to opt to work at super hospitals such as Zhengzhou First. That the hospital is affiliated with a prestigious university also helps it recruit capable medical graduates. Kan is also quick to stress that Zhengzhou First is doing its part to hone the skills of doctors in Henan’s smaller hospitals and clinics. 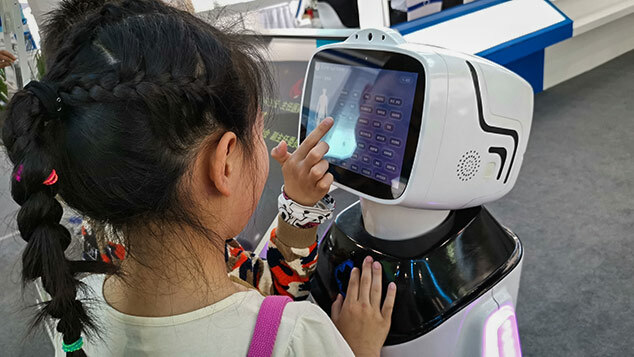 The hospital has invested 320 million yuan in a telemedicine facility that allows doctors to provide consultations, training, and lectures for staff at the smaller hospitals and clinics around the province. Still, there has been pushback from some of the more conservative members of the medical profession in rural areas, underscoring the social and cultural challenges transformation of the health care system faces in some pockets of the country, where efforts to train staff to a higher standard are sometimes met with defensiveness. Kan and Zhengzhou First appear determined to pursue a path to growth. Construction of a second hospital campus, this time in Jinshui, a newly planned district of Zhengzhou, is in progress, with completion scheduled for September. The new wing will add 3,000 beds to the hospital’s official capacity. Compared to the current Zhengzhou First hospital, the new wing will be more advanced in terms of equipment and technology. 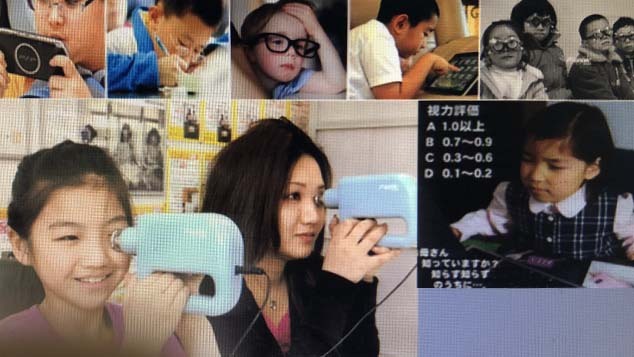 It will also include an International Cooperation Center, to which Kan intends to invite medical experts from around the world to conduct research and share their insights. These experts will include those from top medical institutions in the U.S., Kan said, citing Harvard University and The Hormel Institute at the University of Minnesota as examples. Kan believes that moves toward multi-tiered treatment represent a step in the right direction, though he believes Henan is not yet ready for this. “Grassroots hospitals still have a long way to go,” he said. Additional reporting by Cai Yiwen. Video and photography by Wu Yue.